It's been some time since we last posted, maybe there are still some lost souls wandering around on this blog, if so I have a really funky DIY for you to make! So earlier this week I was planning my outfit for a party and my outfit was quite basic white on white, I wanted to pimp it up a bit with really fancy earrings but I couldn't seem to find the right ones. I looked trough my stuff and found a bunch of beads, green, white. And then it came all back, the memories of me making little crocodiles in pearls when I was a toddler. 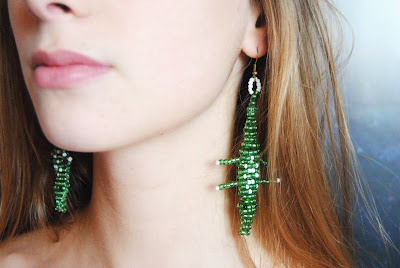 There actually really are a lot of tutorials on how to make crocodiles on the Internet, here you have some sites i looked at for making mines: This one and this one It's actually really simple once you get the trick!